Kate has sent in our first recipe of the month for 2018. 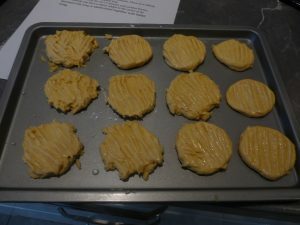 She says that this recipe for Custard Biscuits is loosely based on one that her mother used during the war time when supplies were rationed and so limited that lard had to be used. It is a firm family favourite both for eating and making by grandchildren. We hope that you will enjoy making these biscuits too! Glace cherries/ icing sugar/ butter cream to decorate. Preheat the oven to : Gas mark 4 or 180c or 160c fan oven. 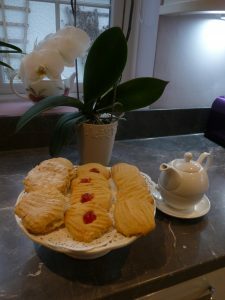 The biscuits can then be decorated by adding a cherry to the centre or by sprinkling with icing sugar or by sandwiching together in pairs with butter icing.